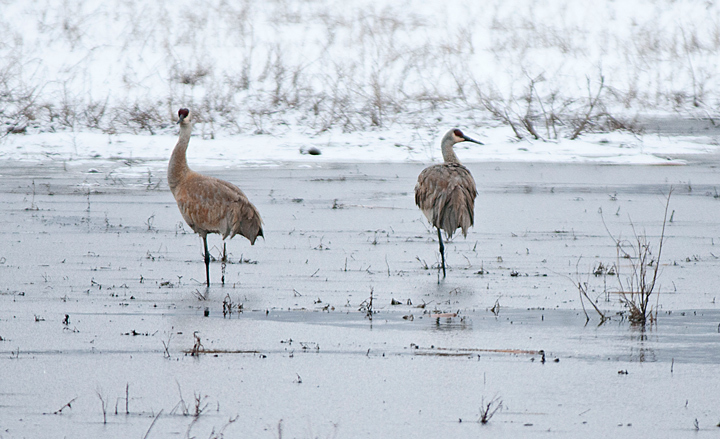 This weekend was the annual Midwest Sandhill Crane Count. Actually it was scheduled for April 14th but we were in the middle of a three day blizzard so the count was postponed one week. This year my wife agreed to go with me as long as I took her to breakfast afterword. We were up before sunrise and headed to my designated area which happened to be Gilbert Creek. The area is surrounded by roads so I typically drive around stopping along the way to listen and watch. We had already gone around once without seeing anything but things picked up just after sunrise. We noticed a pair of cranes in a backwater area. We watched them for a while before I heard several cranes calling some distance away. As we drove past a pond we noticed a second pair of cranes in the pond. I photographed them before continuing on to where I heard the cranes calling. There was a third pair at that location. In all we saw six cranes. This is the most I have counted during the years I’ve been counting. 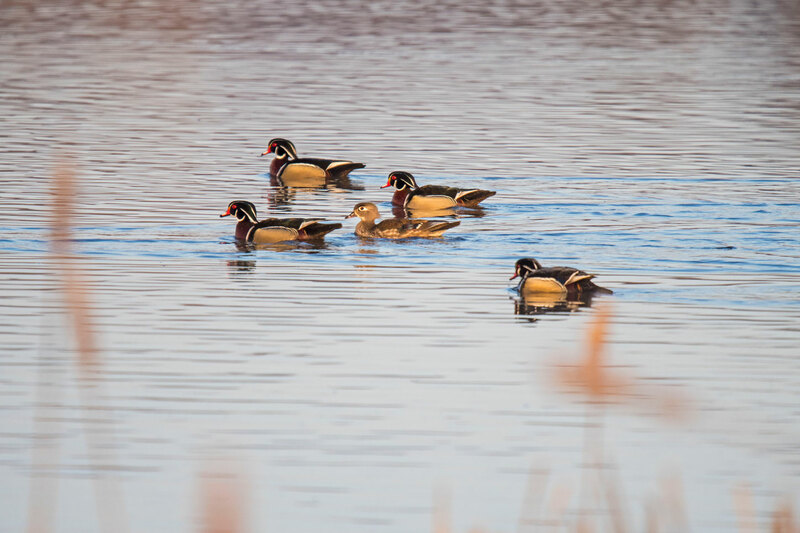 There were also some Wood Ducks in the pond. 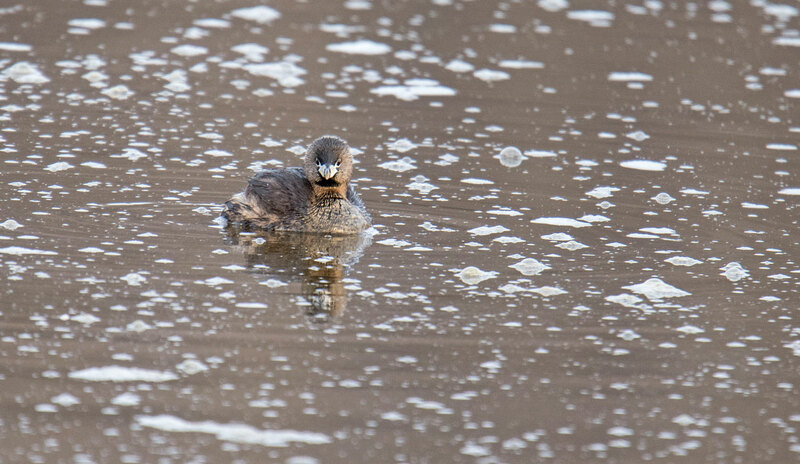 A pair of Pied-billed Grebes were also swimming around. Lots of Red-winged Blackbirds were singing. There was also a Muskrat swimming in the pond. 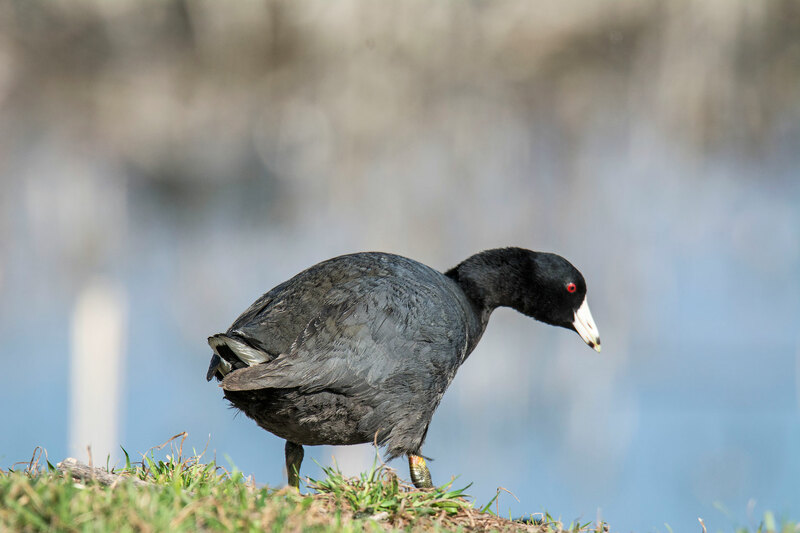 There were a bunch of American Coots in the pond. 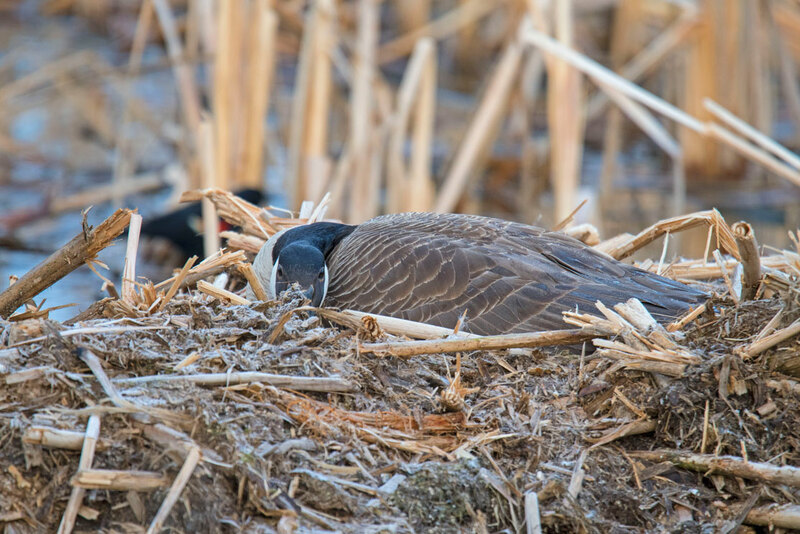 I was surprised to find a number of Canada Geese on the nests considering we were a week away form a three day blizzard. This was one of the best count days I’ve had over the years. This spring we embarked on a road trip to the southwest. On the way we didn’t make many stops. It was really hard to find some compelling landscape photography locations as we traveled through Iowa, Missouri and Kansas on the first leg of the trip. The hawks must have been migrating because we seemed to see one at about every mile marker. Unfortunately one can’t stop while driving of the interstate system. On the second leg of the trip we did stop at Cheyenne Bottoms Wildlife Area in Kansas. It was just a few mile off of the highway and I like to photograph birds. 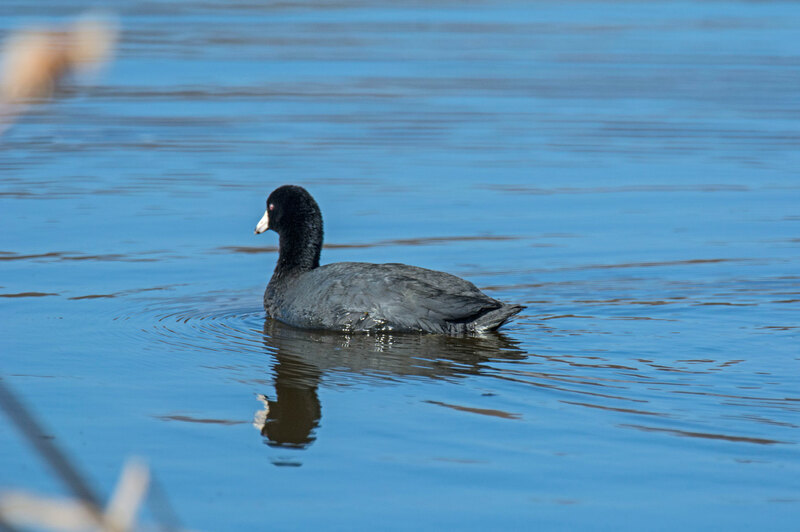 There were a lot of Coots in the Area. There were several large flocks of American White Pelicans in the area but most of them were too far away to photograph. There were also quite a few Northern Shovelers on the flowage. When we left on the trip the Red-winged Blackbirds had not returned yet but we found quite a few of them around. 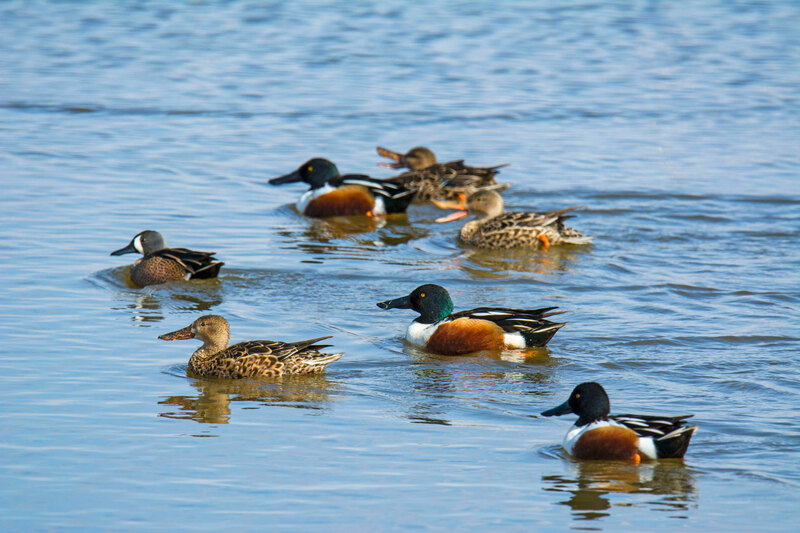 Blue-winged Teals and Northern Shovelers were hanging out together. I thought we would find more shorebirds around but we only saw Yellowlegs in a couple of places. At the end of the second day we ended up in Amarillo Texas. 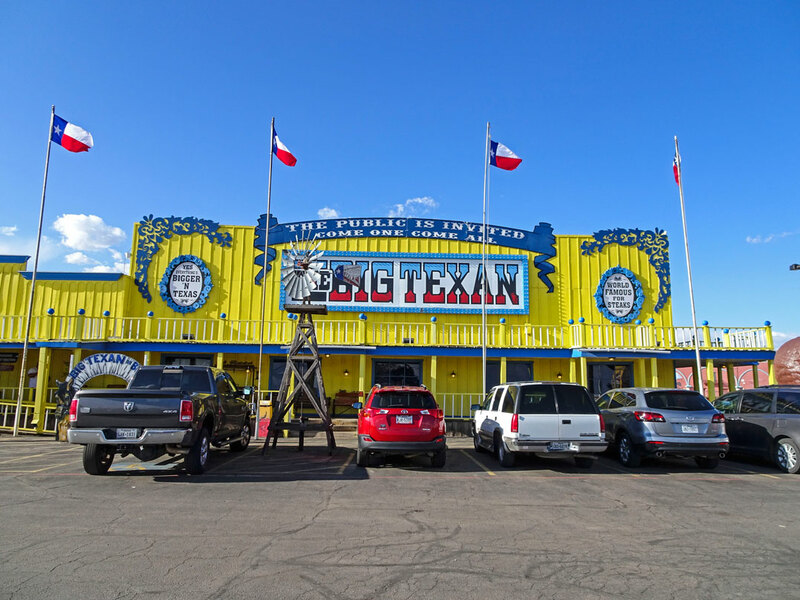 Not much to see in Amarillo but we did stop at the Big Texan Steak House. It looked like a Wall wannabee. We ordered the special of the day and decided to split the order. My wife likes her steak well done and I like mine a little on the rare side so we ended up selecting medium. When it came the cow was still kicking which was fine with me but my wife sent her half back twice before it ended up well done. By the third trip to the kitchen it was like shoe leather. I liked the visit she didn’t. When we arrived at out hotel in Amarillo we were surprised to find a large number of Chinese. Turns out they were installing windmills in Texas. Seems our government is so busy pushing coal technology they are leaving the technology of the future to the Chinese. We recently spent a morning driving around Crex Meadows. 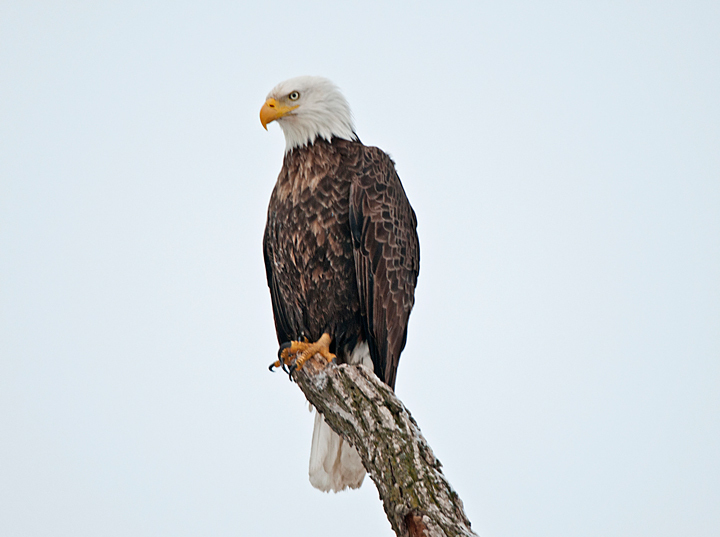 During a stop at the visitors center we found that several eagles had been spotted earlier in the morning. We were lucky to find they were still hanging around. This one was sitting by the nest. A little later in the morning we noticed it was hunting on Phantom Lake. When it caught a fish it went back to the nest were we were able to watch it feeding its young. We did not spot many Sandhill Cranes. This one was near the road. 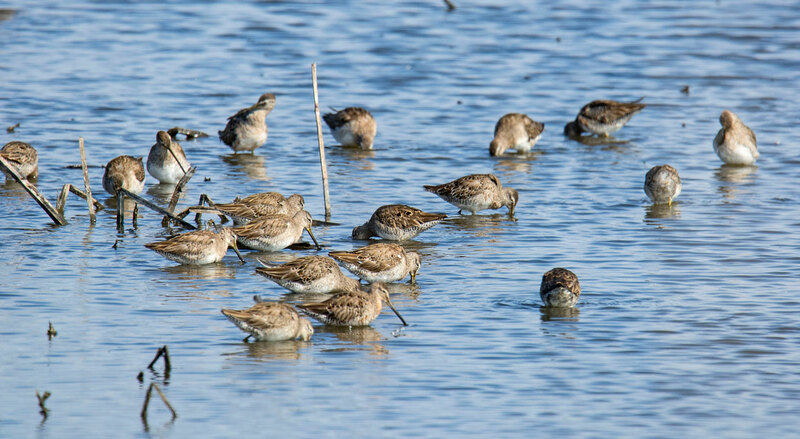 I suspect most of the others were nesting deeper in the marshes. We could see Trumpeter Swans nesting but they were all quite some distance from the road. We did encounter three non nesting swans in a small pool. We found this pair of Ring-necked Ducks in a small pond. Lots of Red-winged Blackbirds around the area. 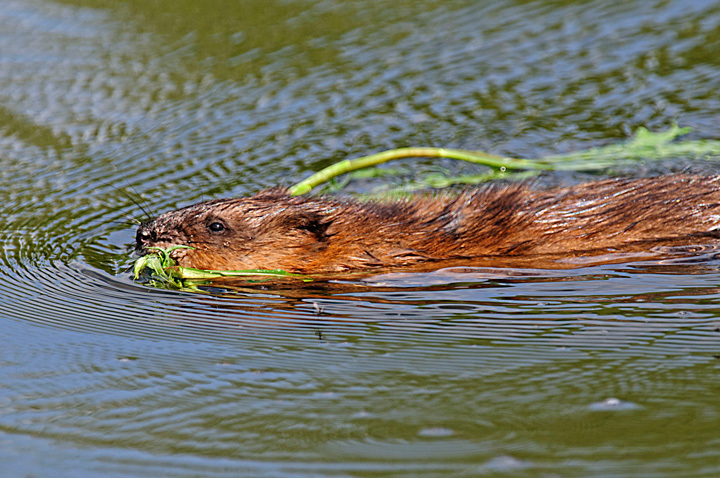 The muskrats were very active throughout the flowages. We noticed this Killdeer ahead of us so we stopped. It was very accommodating and walked right up to us and posed for photos. The marsh grass provided some interesting patterns. In the second photo the area had recently been burned providing for a variety of colors as it started to grow again. The Lily Pads were starting to grow now that the ice is off of the flowages. Last week we made our first summer visit to Crex Meadows since returning from Iceland. Things have really changed since our last visit. The large amount rain we received in May and June has raised the water levels in the ponds and really made the vegetation grow. In some places it is difficult to photograph from the car because the grass is so high along the road. We found some Wood Ducks sitting on a log. On our second pass around the Meadows this one was still sitting there and posed for me. It’s the first Wood Duck I’ve been able to photograph up close and my first one at Crex. The ducklings were all over the place. It was fun to watch them making their way through the lily pads. This Red-winged Blackbird landed next to the road. I had my wife drive up to it and it didn’t move. I was able to get some great shots before moving on. We found this fledgling sitting in the road. When we stopped it hopped into the foliage along the road and sat there while I took its picture. 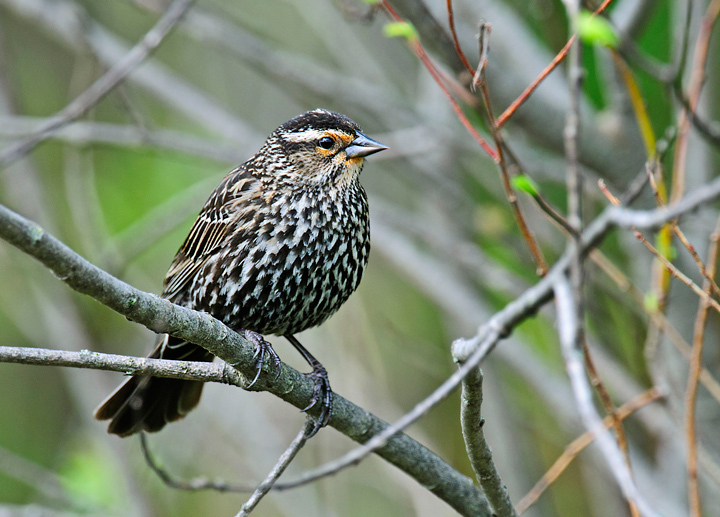 I think it was a young Red-winged Blackbird. There were lots of Trumpeter Swans around with their young. They looked to be teenagers now. We drove past a Bald Eagle nest on the north side of the refuge. It had one eagle in it. The wind was blowing and it seemed to be testing its wings into the wind. I will probably be gone from the nest very soon. A short time later we encountered two Sandhill Cranes walking through the Prairie. I’ve photographed Great Blue Herons before at Crex but this is probably the best photo of them that I’ve gotten. It was a great day for bird photography. 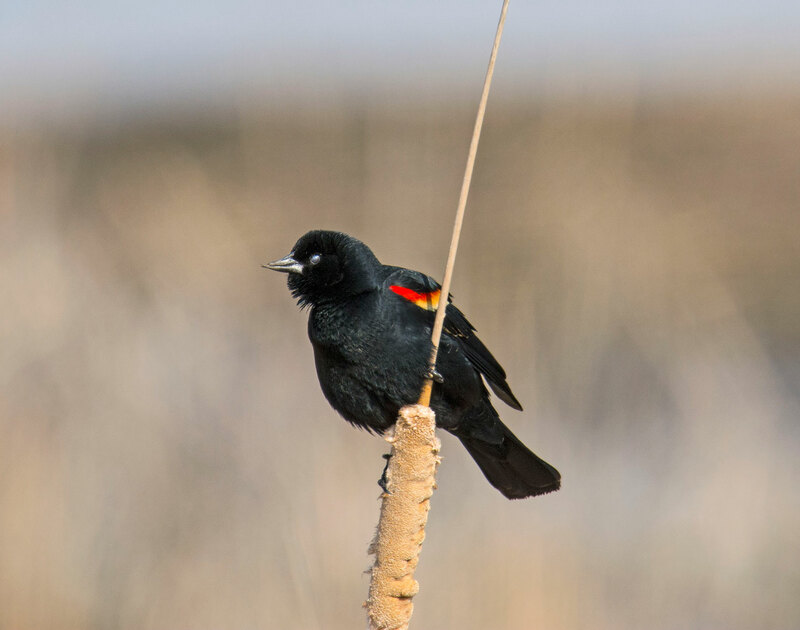 The Red-winged Blackbirds have been back for a few weeks. During the annual Sandhill Crane Count I counted over sixty of them in my count area. As we were driving back from a visit to Hoffman Hills my wife noticed this immature Bald Eagle sitting along the road. I was looking at something else and missed it so we turned around and drove back to the location. It was still there and posed for a few shots. Just down the road we found an American Kestrel working the fields. This is not a very good shot it is the only one I’ve ever gotten of an American Kestrel. 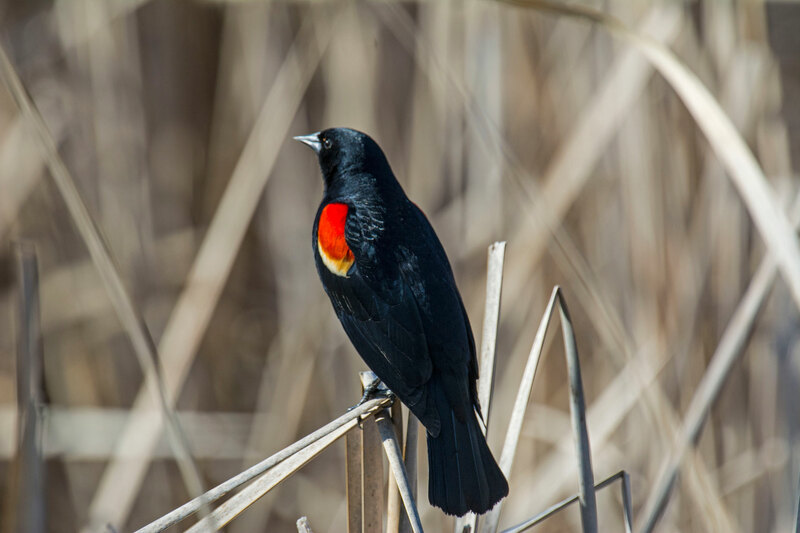 The Red-winged Blackbirds are back in large numbers and can be found at various wetland areas. This past week the early spring birds started returning to our area. Sandhill Cranes are migrating through the area. Large numbers of them can be found along the Red Cedar Trail. 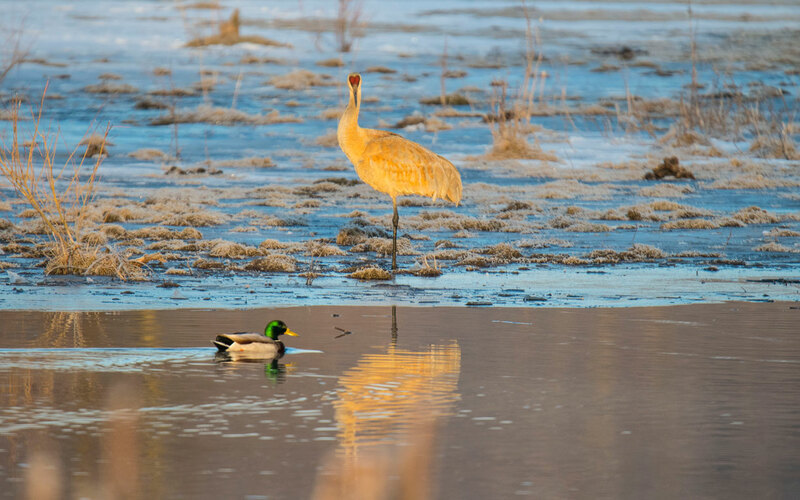 The spring Midwest Crane Count will be taking place on April 12th. They are looking for volunteers to count cranes. 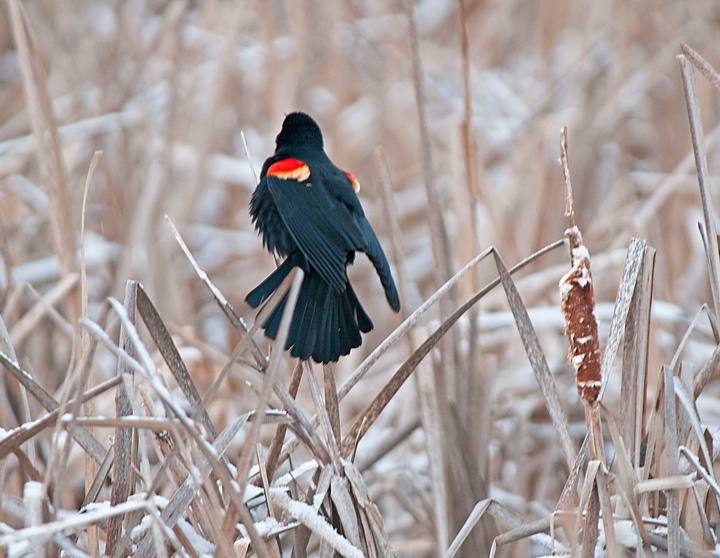 Red-wing Blackbirds are starting to show up in the marshy areas. 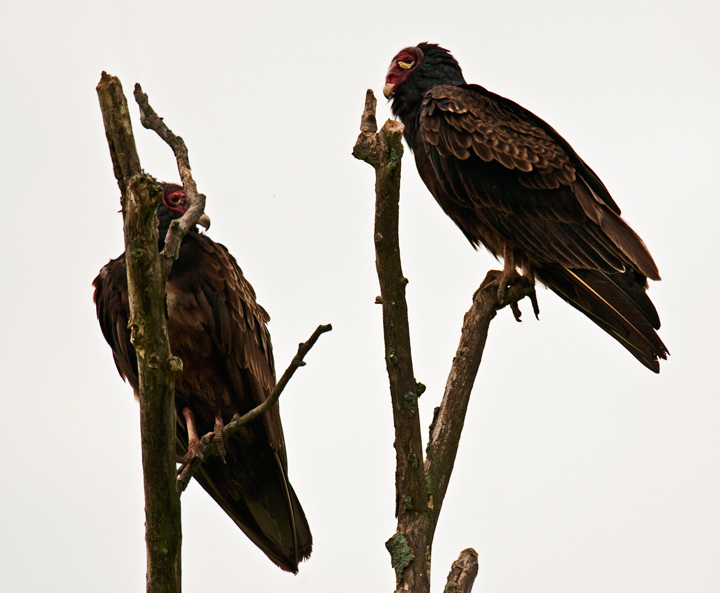 A few Turkey Vultures can be seen circulating. 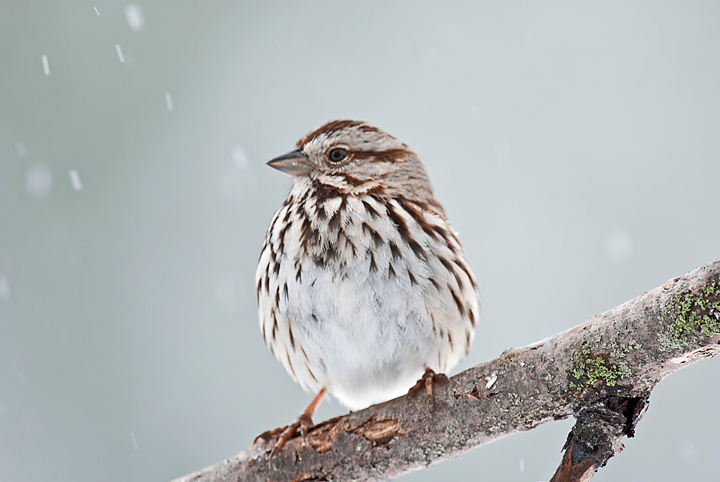 I’ve had a few song sparrows around my feeder although they seem to be migrating through. I think some of the birds will be surprised by the blizzard that is on its way. Today was the annual Midwest Crane Count. For the past ten years I’ve been counting at Gilbert Creek Wildlife Area which is not far from my farm. 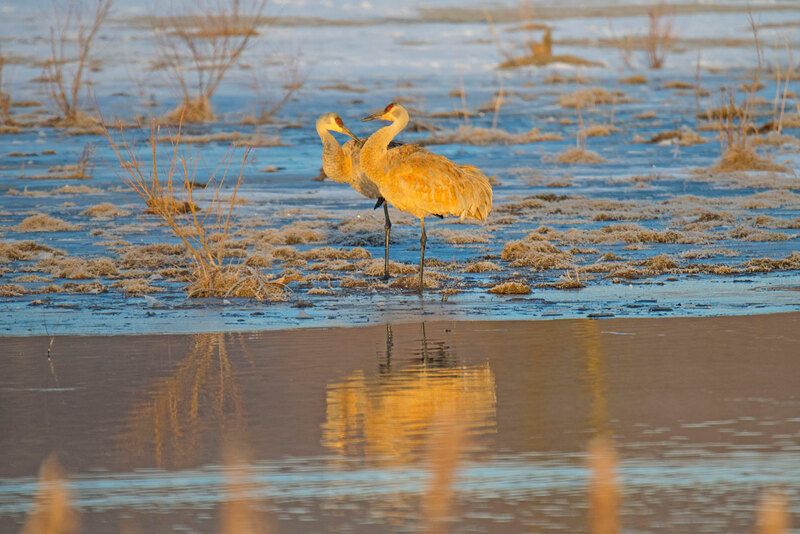 Counting cranes is a great spring activity and if you are interested in participating next year check out their website. The crane count is one day in mid April each year and runs from 5:30 to 7:30 in the morning. This morning I had been looking and listening for cranes for over an hour and a half and still had not seen or heard any. I decided to make one last pass through the area when I spotted two of them in a small pond. I’m not sure where they had been earlier. I had been past the pond several times and still had not seen them. Birds of Prey were also around. I saw several Red-tailed Hawks and was able to get some nice photos of a Bald Eagle who posed for me on a tree next to the road. This year there were quite a few birds to be seen. 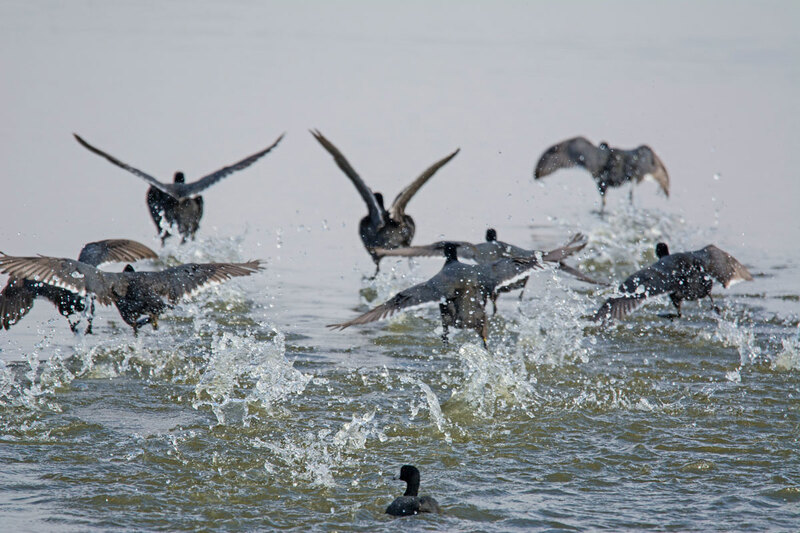 Lots of Canada Geese, a variety of ducks including Mallards and Blue-winged Teal. There were also a variety of smaller birds around including lots of Red-winged Blackbirds, Killdeer and Eastern Phoebes. More photos from Gilbert Creek Wildlife Area can be found on my website. I’m a frequent visitor at Hoffman Hills State Recreation Area. This spring has been different from previous years. The biggest difference has been the abundance of animals in the area. 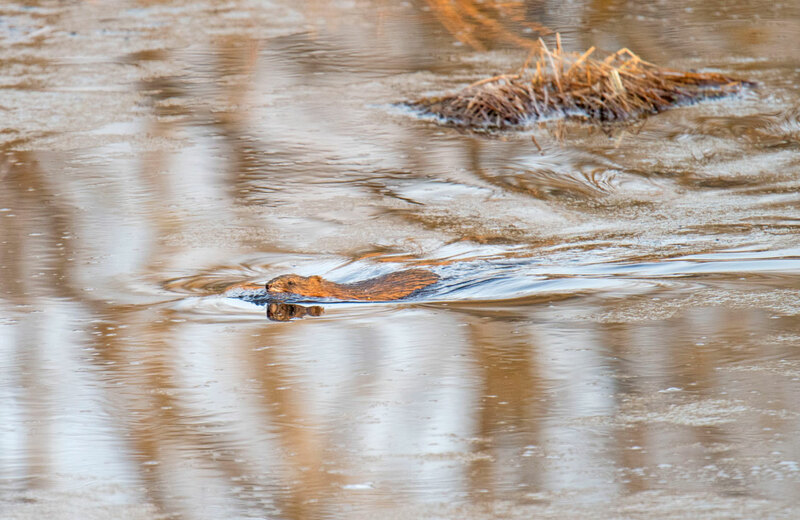 Typically I see a Muskrat every now and then but this year there have been two pairs of muskrats in the wetland ponds. They have been very active and I’ve been able to watch them feeding and bringing material to their lodge. 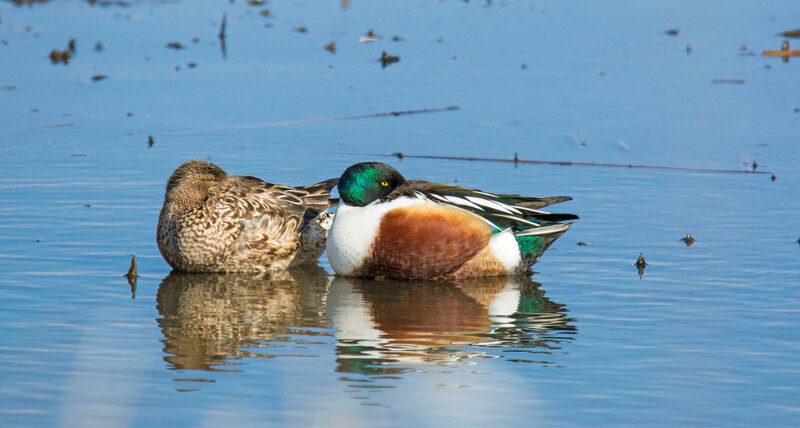 They have been so active that they have undermined the dykes around the ponds. In one case I almost stepped in a hole where the dyke collapsed. In another case I was photographing the muskrats and when I stepped back the ground gave way. I ended up calling the DNR to report the problem and they filled the holes. 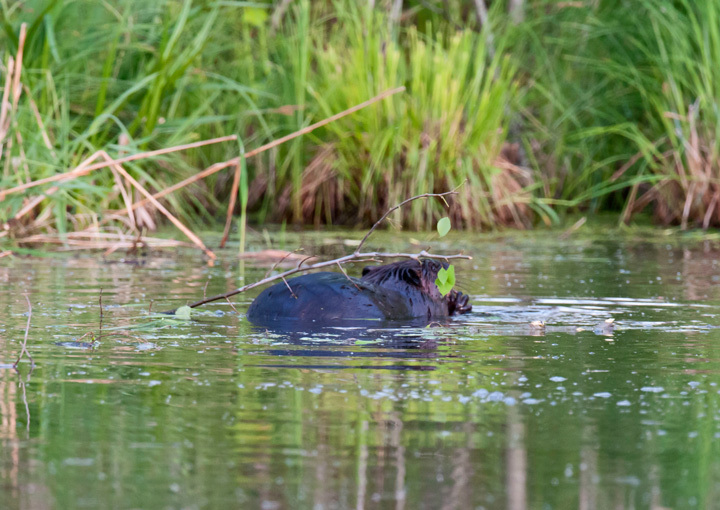 In addition to the muskrats there have been a pair of beaver in the area. As I reported in an earlier blog they had been cutting down small trees in the wetland areas. 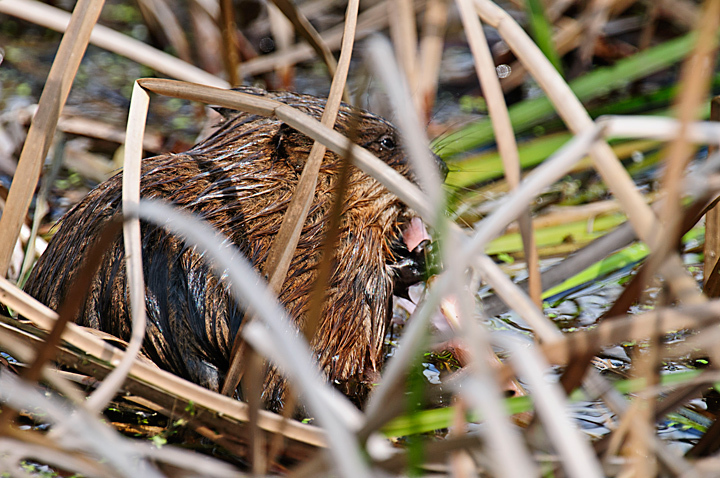 At one point I had thought they left the area because I hadn’t seen any fresh sighs but my wife and I happened to be in the area on an overcast day and saw both the pair of beavers. A couple of days later we went back at sunset and watched them as the sun went down. There are a variety of birds in the area. At one point I saw Yellow, Common Yellowthroats and Palm warblers as they migrated through. It was difficult to photograph them because the trees leafed out so early this year. 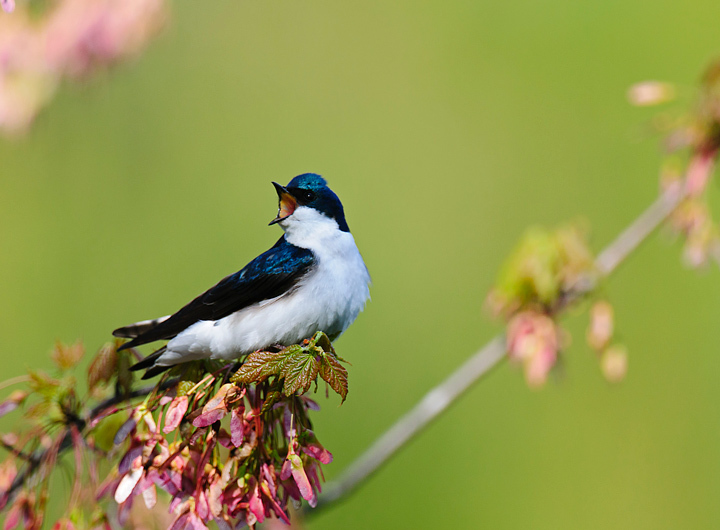 The Tree Swallows and Eastern Bluebirds have hatched there first brood but are still in the area. 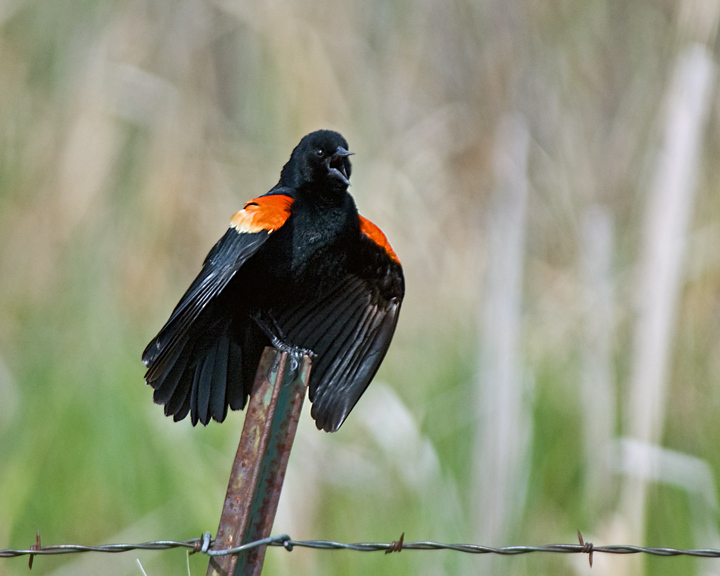 This year for the first time I did get some photographs of Red-winged Blackbirds. For some reason they seem to want to avoid the camera but this year they have been more cooperative. The Canada Geese did nest this spring but the young hatched and they left the area after a couple of days. For the first year in a number of years I did not get any photographs of them. 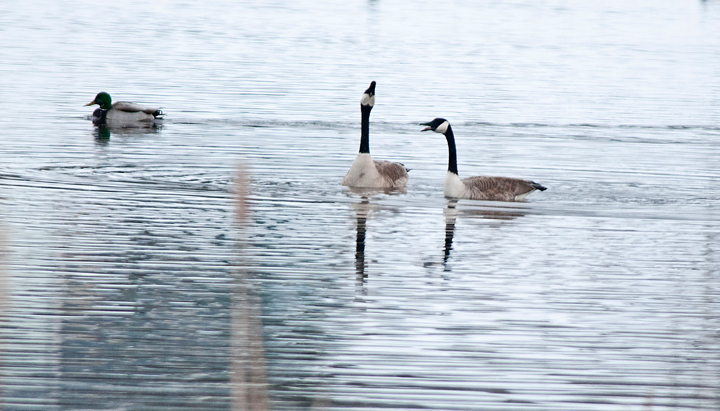 There were also couple of pairs of non nesting Canada Geese that frequented the ponds for a few weeks. 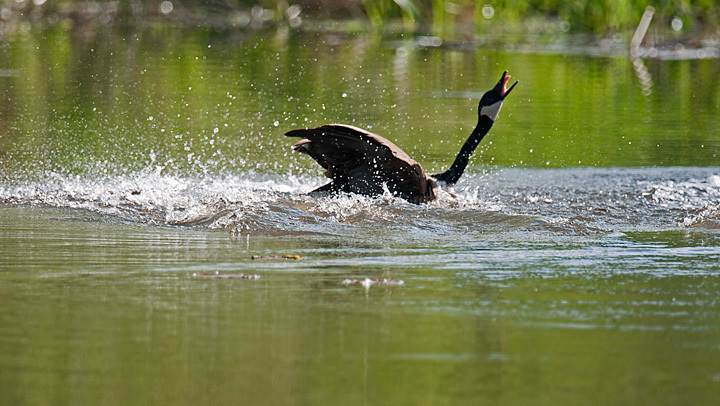 They provided some great entertainment as they flew back and forth between the ponds and then chased one another. The early spring wildflowers are just about gone. 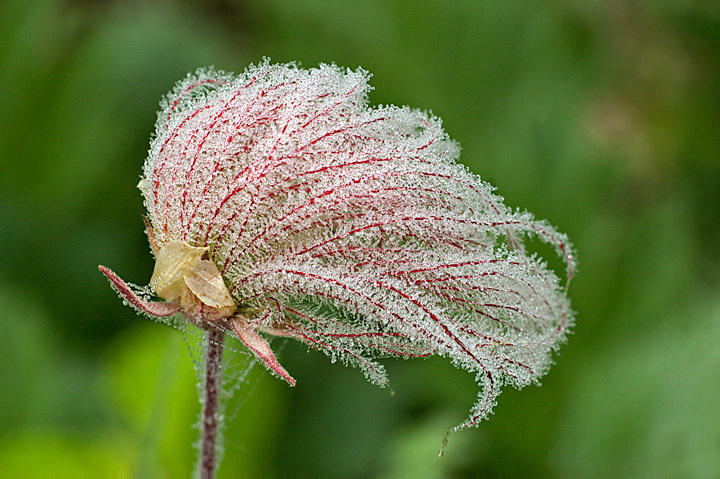 It has been so windy that I wasn’t able to take many photos of the Prairie Smoke and it is just about done for this year. The Wild Lupine is almost gone as well. 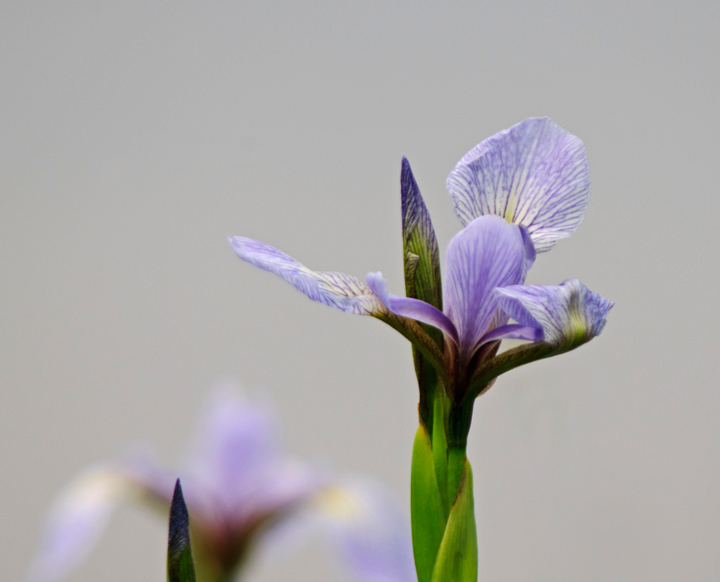 I’m just starting to see the Orange Hawkweed, Spiderwort, and Blue Flag Iris.